BELLEVILLE – The Youth Room at Quinte Sports and Wellness Centre is wrapping up its first ever winter clothing drive. 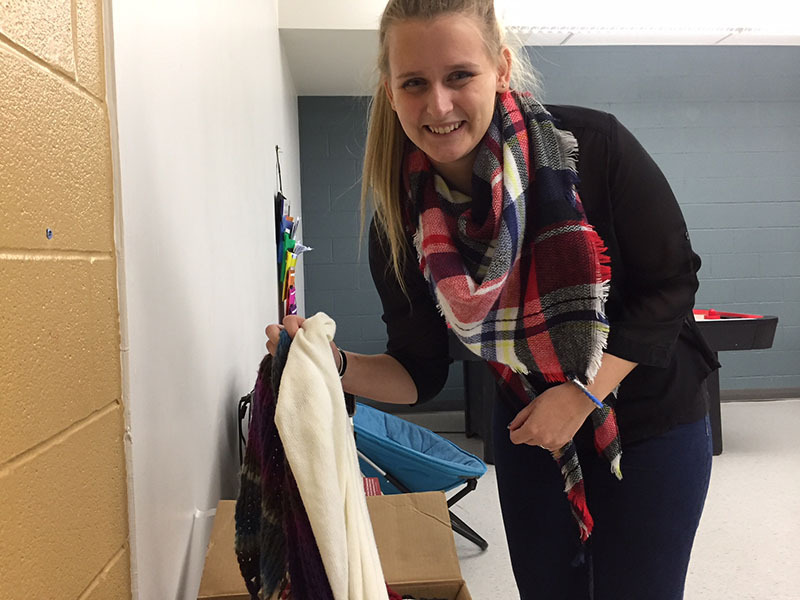 Youth programmer Nikki De Haan and her volunteers have been working to collect new and gently used winter clothing accessories such as hats, mittens and scarves for those in need. Their plan is to pair the accessories with the Salvation Army’s Coats For Folks program – a program that accepts new and gently-used coats for those in need. De Haan said the idea came to her one night, when she noticed the homelessness population in downtown Belleville while working her second job teaching dance. “Constantly hearing of and seeing people out in the cold is just heartbreaking,” said De Haan. When she came into the Youth Room the next day, still upset about the issue, she talked to one of her volunteers about it. That’s when they came up with the plan. It started with a quickly drawn up poster and a few social media posts and has taken off since then. They reached out to the Salvation Army and decided to pair the donations with the coats. That way when people come to get their coats, they can grab a pair of mittens, a hat and a scarf to go with it. Any extra accessories will be left at warming stations throughout the city. She hopes this will help make the community a bit more comfortable until a more permanent solution is put in place, she said. The program also gives youth a chance to get involved, said De Haan. “All of the volunteers in the youth room with me, they know they can make a difference in their community,” she said. The drive has been far more successful than De Haan said she thought it would be. Knitting groups donated hats and scarves in bundles. Even some local schools like Quinte Secondary School got involved by starting their own drives. It’s hard for young folks sometimes as they feel like they can’t make a difference, she said. “We’re affecting the community so much with just a pair of mittens,” said De Haan. Those who wish to contribute to the clothing drive have until Nov. 30 to get their donations to the Youth Room. After that, De Haan recommends contacting Salvation Army about where to drop off any extra donations. The Youth Room will be open to accept donations Wednesday from 4 p.m. to 8 p.m and Thursday from 4 p.m. to 7 p.m.